Some girls collect shoes, I collect kitchen gadgets and cookbooks. And Nick is well aware of my culinary interests. Yes, he buys me fancy jewelry for special occasions, but he also spoils me with gifts like this beautiful Emile Henry tagine. Tagines are ideal for cold-weather cooking, and so we pulled it off the hutch last week to use before spring arrives. 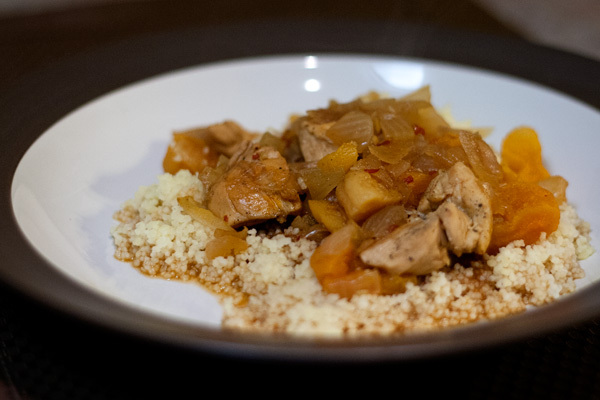 This recipe is a classic one with honey and dried apricots and Moroccan spices, served with chicken, over a bed of couscous. You could replace the chicken with the more traditional lamb, or serve it over rice, if you prefer. Either way, it produces the most wonderful natural potpourri while it stews on the stovetop. You don’t really need a tagine to cook this comfort dish. Simply use a Dutch oven or stockpot. Just make it before the days get longer and grilling season arrives. Add olive oil to tagine (or Dutch oven or stockpot) and set over medium-high heat. Sprinkle chicken evenly with 1/4 teaspoon salt. Add chicken to tagine and cook until brown on all sides, about 4 minutes. Remove from pot. Add onion and sauté for 4 minutes, stirring frequently. Add remaining 1/4 teaspoon salt, cumin, cinnamon, red pepper, and garlic; sauté for 1 minute, stirring constantly. Stir in honey and tomato paste and cook for 30 seconds, stirring frequently. Return chicken to pan. Add apricots and broth; bring to a boil. Cover, reduce heat, and simmer for 1 hour, or until chicken is tender, stirring occasionally. My brother gave me a tagine for Christmas that for some outrageous reason I haven’t broken in yet… I already promised myself that I’d do so this weekend, and this post has completely convinced me it’s TIME already! ooh i’ve been coveting a tagine for a while! This look delicious, I love the sweetness! I love this kind of meal! We’ve been making one with sweet potatoes and prunes this winter. The cinnamon and cumin combo is so good!